As a special education teacher, I think it's pretty safe to say I am a pro at Velcro in the classroom. I use it for EVERYTHING! :) And I've learned a few tricks along the way. 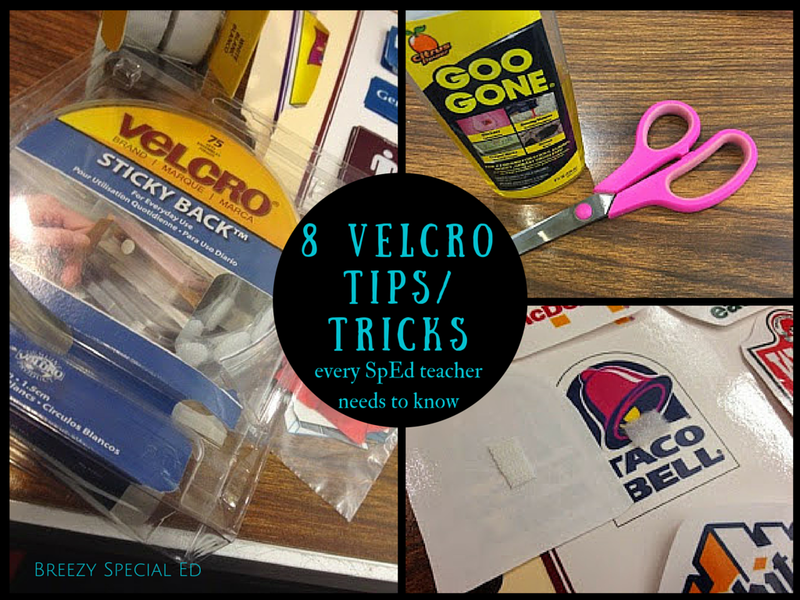 Here's what I think every teacher should know about using Velcro. 1. First, Velcro dots are amazing and will save your life and sanity. They are so quick to use!! I especially love using dots for my adapted books. 2. However...Velcro dots are also expensive. So to save money, buy the strips of Velcro. These can be wide, so I like to cut them in half. Long and skinny is the best way to cut it. 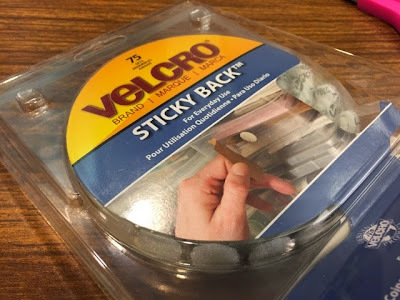 This helps make your Velcro go farther and also helps with smaller activities (like file folders) by not making it stick too well (making it difficult to easier pull off). 4. Cut small pieces in advance. When I have a student absent, sometimes I will give their aide the (terrible) task of cutting apart Velcro. It can only be done so long before people start to go insane, so do be nice :) but it is so helpful when putting together an activity to have the Velcro all ready to go. 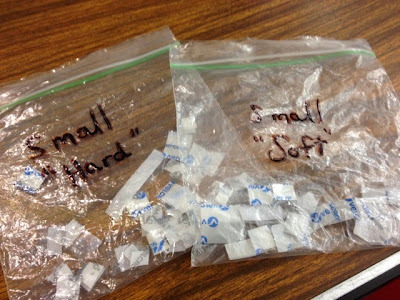 When cut, I keep them separate in bags labeled "hard" and "soft"
6. Goo-be-Gone is a lifesaver. 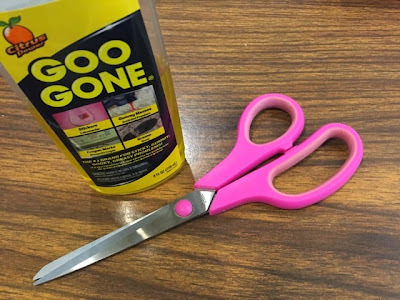 When the Velcro starts to build up on your scissors (or when someone uses the wrong scissors), a dab of this stuff will make them as good as new! 7. 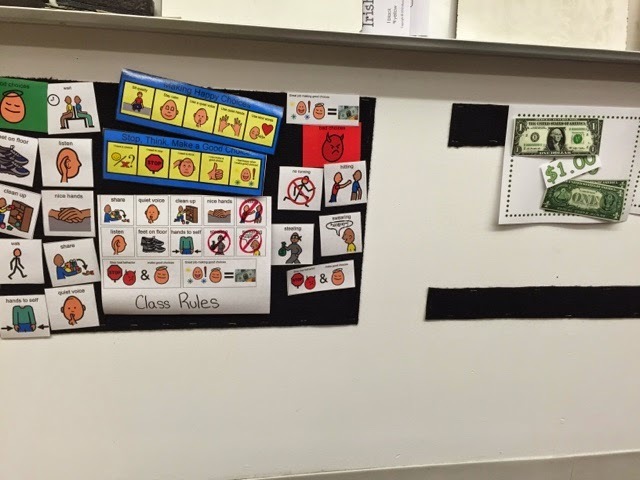 Be consistent with your Velcro placement across your classroom. Our rule is "Hard on the card. Soft on the surface." 8. Another reason I like our 'Hard on the Card. Soft on the Surface' rule is that is allows me to use carpet squares for storing Velcro across my classroom. I even know some classrooms that have carpeted walls for this purpose! I bought rugs at the dollar store and stapled them to my walls in various areas to stick Velcro on. And then the other day I got this awesome divider made of carpet so Velcro works on it too! SCORE! Those are carpet squares! Our rules are all on one carpet square and the money posters are on strips that I cut from a carpet square. 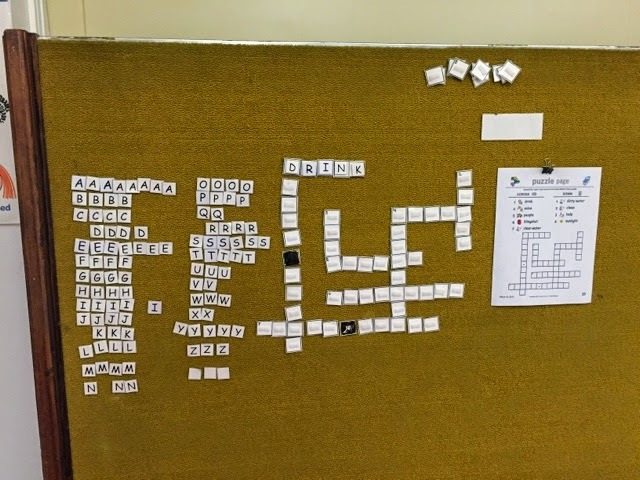 Our Velcro crossword puzzle fits great on our carpeted bulletin board! I use Velcro the most on my file folders and my many adapted books, but you can find it all over my room! Alright, what tricks and tips did I miss? 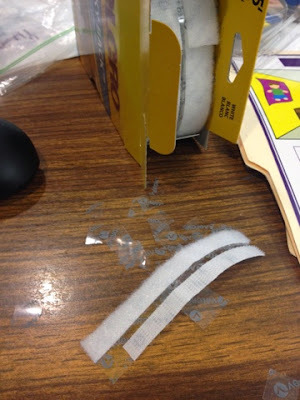 Please share how you use and manage Velcro in your classroom! You need to get Fiskars nonstick titanium scissors.They are worth every penny! I got mine 2 years ago just for velcro and they are still going strong! 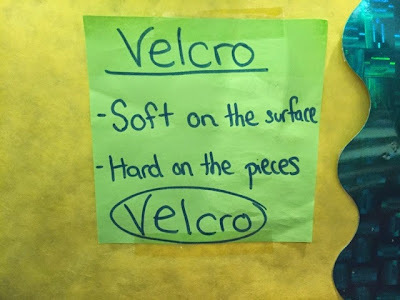 (My Class runs on velcro!) I got mine at Michaels with a coupon so they were very inexpensive! For some reason these pink scissors I have are the bomb, but I don't even know why! I will add that to the post, might help someone else! :) Thanks for sharing!! I wish my EAs would remember the "Soft on the surface" rule! I hate getting my sweaters stuck to Velcro! Great post, by the way, I can totally relate! Try posting it! Or writing it all over your Velcro boxes :) Seriously, that helped me so much. Now, my aides remind each other! It's great. I order my velcro from feinersupply.com you can order by the roll soft or hard and you get over 1000 dots on one roll! I can so relate! Love the carpet idea....this, I did not know about it!!! Also, can't wait to get ahold of some of these scissors! 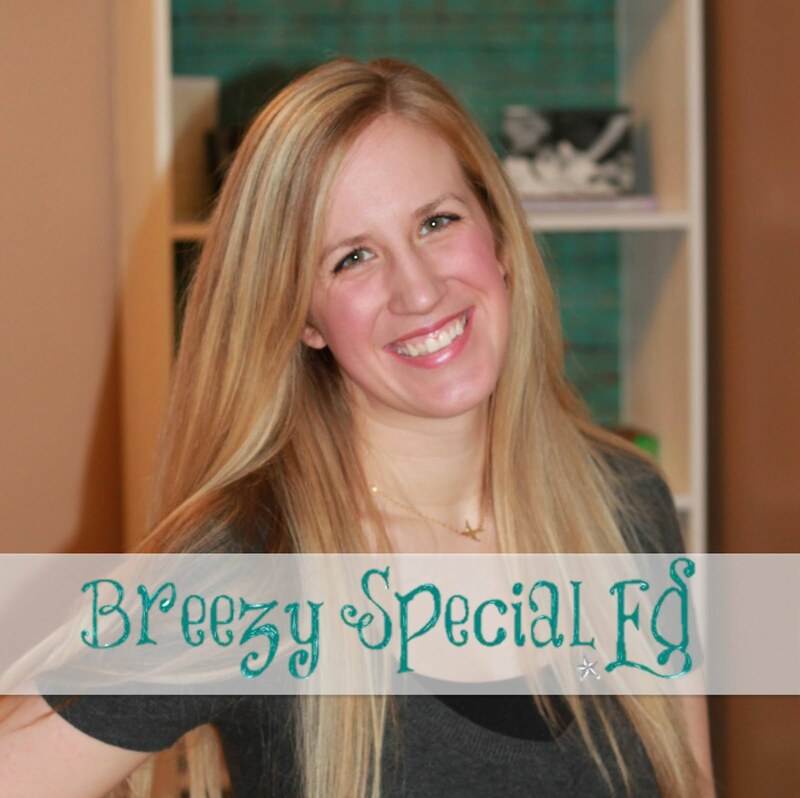 All great tips Breezy! Thanks! Feel funny asking...what's the easiest way to get the plastic off the velcro strip when you go to stick it on. It tears apart my nails and takes forever to separate. Quick trick? It's not easy...ever. But if you can keep a little part of the paper part showing it will peel off easier, but that's not always possible. I've seen classrooms use felt on a bulletin board too just like you use the carpet squares. Worked great and some buildings supply it in the work room! Probably not at sturdy long term but still an idea!